Israel is being investigated by its fellow ally’s State Department for the illegal use of American-made cluster bombs on south Lebanon. Apparently Israel not only violated the Geneva Convention for using cluster bombs on civilian areas but also secret agreements with the United States that restricts when it can employ such weapons. 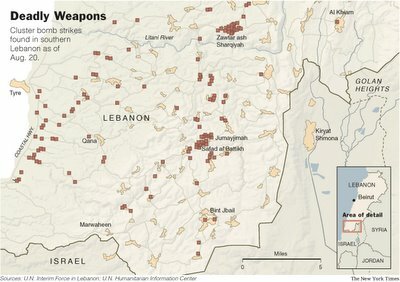 According to the New York Times, the investigation by the department’s Office of Defense Trade Controls began this week, after reports that three types of American cluster munitions, anti-personnel weapons that spray bomblets over a wide area, have been found in many areas of southern Lebanon and were responsible for civilian casualties, even till today. The agreements that govern Israel’s use of American cluster munitions go back to the 1970’s, when the first sales of the weapons occurred, but the details of them have never been publicly confirmed. The first one was signed in 1976 and later reaffirmed in 1978 after an Israeli incursion into Lebanon. News accounts over the years have said that they require that the munitions be used only against organized Arab armies and clearly defined military targets under conditions similar to the Arab-Israeli wars of 1967 and 1973. A Congressional investigation after Israel’s 1982 invasion of Lebanon found that Israel had used the weapons against civilian areas in violation of the agreements. In response, the Reagan administration imposed a six-year ban on further sales of cluster weapons to Israel. 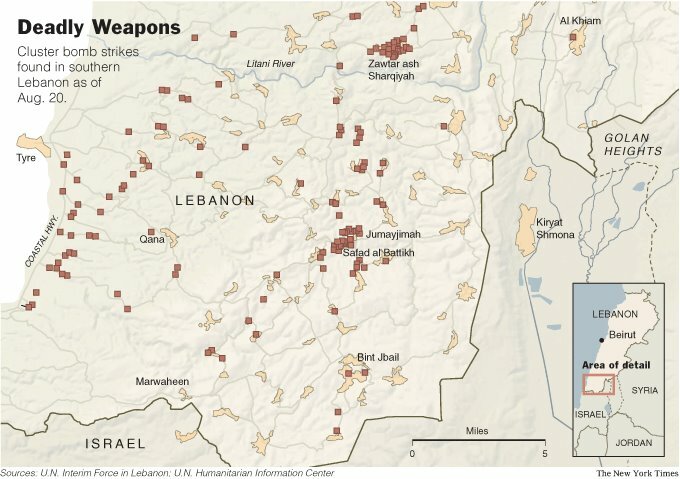 A report released Wednesday by the United Nations Mine Action Coordination Center, which has personnel in Lebanon searching for unexploded ordnance, said it had found unexploded bomblets, including hundreds of American types, in 249 locations south of the Litani River. The report said American munitions found included 559 M-42’s, an anti-personnel bomblet used in 105-millimeter artillery shells; 663 M-77’s, a submunition found in M-26 rockets; and 5 BLU-63’s, a bomblet found in the CBU-26 cluster bomb. Also found were 608 M-85’s, an Israeli-made submunition. The unexploded submunitions being found in Lebanon are probably only a fraction of the total number dropped. Cluster munitions can contain dozens or even hundreds of submunitions designed to explode as they scatter around a wide area. They are very effective against rocket-launcher units or ground troops. In 1982, delivery of cluster-bomb shells to Israel was suspended a month after Israel invaded Lebanon after the Reagan administration determined that Israel “may” have used them against civilian areas. But the decision to impose what amounted to a indefinite moratorium was made under pressure from Congress, which conducted a long investigation of the issue. Israel and the United States reaffirmed restrictions on the use of cluster munitions in 1988, and the Reagan administration lifted the moratorium. The use of these weapons is hotly opposed by many individuals and groups, such as the Red Cross, the NGO Cluster Munition Coalition and the United Nations, because of the high proportion of civilians that have fallen victim to the weapon. The particular threat this weapon poses to civilians exists for two main reasons. First, because of the weapon's very wide area of effect, accidentally striking both civilian and military objects in the target area is possible. The area affected by a single cluster munition, also known as the footprint, can be as large as two or three football fields. This characteristic of the weapon is particularly problematic for civilians when cluster munitions are used in or near populated areas and has been documented by research reports from groups such as Human Rights Watch and Landmine Action. Secondly, depending on type and their use, between 1% and 40% of the bomblets do not explode on impact. These unexploded ordnance (duds) present a particularly dense and dangerous form of post-conflict contamination and may unintentionally act like anti-personnel land mines (which have been banned in many countries under the Ottawa Treaty) for several years. War is a business! These kind of bombs have been used for decades in Lebanese-Israeli conflict! Just to say HELLO ! Happy to visit your blog. Well the shame of it is I supply electronics to defense contracters. Granted not bombs but Red Stone Missles, Aircraft Carriers, Joint Strike Fighters & some other neat projects. Aas long as there are crazies out there weapons will always be needed. The Lebs are asking for it plain and simple. Just like all of the other myrters of the world. Most likely the Bush administration is trying to come out with a report on Israel's use of cluster munitions before the UN Human Rights Council does. The UN Human Rights Council could refer their findings to the UN Security Council which could result in the Bush administration having to veto Israel from being found guilty of war crimes. The US Supreme Court has already found the Bush administration guilty of violating the Geneva Conventions and the US War Crimes Act. However when the Bush administration breaks the law Republicans in Congress simply change the law - retroactively. Good for them! Keep on fighting the good fight. Try voing and maybe you'll get some really smart people in there to stop this........ Oh wait, there's that word vote again. Dems have forgotten how to do it. Darn straight we allowed them to keep some strength.... We need a reason to make them go bye bye. The time as come for all Americans who simply have a heart to gather copies of these reports and meet with their representatives to demand the ban of these weapons. This is terrible we support the use of this and our military is guilty as well. Look in the mirror ~ is this what you support? If not then take a stand. Today, Friday, only NBC News covered the problem of cluster bombs in south Lebanon that I saw - in about a 90 seconds story. Neither ABC or CBS covered it - a rather significant omission perfects reflecting a pro-Israeli bias. However the story received steady attention online. It's a bit inaccurate to describe this unexploded ordnance as duds, since the definition of a dud is an explosion that fails to occur. Most often in these cases, the detonation is just delayed. This has become a horrific problem in Iraq, since from the earliest days of the war in 2003, there have been stories of cluster bombs detonating when they are disturbed by civilians. One of the most ghastly stories I read, concerned an infant who crawled over and unexploded cluster bomb. The child's mother showed up at the local hospital hysterical with her baby in two pieces. Thousands have been killed or maimed or injured by these devices, which were dropped in the thousands all over the country, even Iraqi prisoners of war in US custody have lost their legs after stepping on unexploded cluster bombs in their prison compounds. You'd think they'd sweep the place for those things before they began confining people to such areas. I would hope that someone in Lebanon will expend some resources on metal detectors, so that vital areas where people move about regularly, like schools, agricultural fields, wells, roads and paths, can be checked for these lethal devices. As an American (US citizen) just let me take this opportunity to apologize to all the people of Lebanon for the role my government played in instigating Israel's actions, and then our failure to push for an immediate cease-fire, when it became apparent to all individuals of conscience that it needed to happen sooner rather than later. As a voter in this republic/democracy I cannot avoid my own personal responsibility for the actions of my government. I feel deep shame for allowing my government to be taken over by war mongering fools and opportunists. In the upcoming elections I will be doing what I can to help right their wrongs. I think that the actions of the Israeli government, demonstrate the depth of their disarray after the loss of Sharon. Hard to believe that he became the voice of reason keeping the nutcase is in check, the world has changed since this stuff was happening in 1981. Same thing in my country, the people who were once considered the farthest right you could possibly be, are now the moderates struggling to be heard. I wish there was something I could do about it at this very moment, but our president (supposedly our elected representative) isn't interested in listening to the people of the United States of America (supposedly his boss) anymore, he's decided to go his own way, and we're just along for the ride. Over here the propaganda machine is working overtime, and those who disseminate dissenting voices are being charged with sedition (material support for terrorism). Recently a New Yorker, Javed Iqbal, got indicted for rebroadcasting Al Manar (the Beacon). Even though we have laws to protect people, in this case it's the First Amendment, the government is proceeding with his prosecution. Most thinking Americans are not too thrilled about seeing US law dismantled by the Bush administration. Apparently their position is that they've got the power, and there's nothing we can do about it, so there. Perhaps if we can uncover justice from the rubble of the American dream, George W. Bush will one day face the trial for treason and crimes against humanity, he so rightly deserves. I'm glad the bombs and shells are not falling on your heads, I long for the day when humanity finally grows up, and learns to practice war no more. Peace my brothers and sisters, peace be unto you. I feel no shame for our government supplying the Israelis all the weapons they need. Infact, I would encourage it. If its possible I would give the IAF some of our old B52's and they can really create devastation in lebanon, syria, and iran. By the time IAF is done bombing. lebanese people will be using donkeys and camels as transportation. Just like the good ol' days. Unlike aaron x ..... more arms to the IDF.